Spectator View for HoloLens is being actively refactored. This work is intended to consolidate the Preview and Pro codebases and extend support to HoloLens 2. When wearing a HoloLens, we often forget that a person who does not have it on is unable to experience the wonders that we can. Spectator View allows others to see on a 2D screen what a HoloLens user sees in their world. 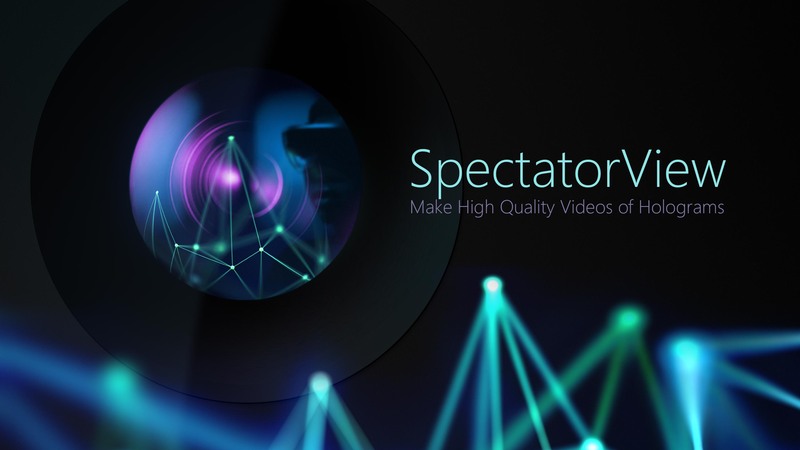 Spectator View (Preview) is fast and affordable approach to recording holograms in HD, while Spectator View Pro is intended for professional quality recording of holograms. Filming holograms in HD: Using Spectator View (Preview), you can record a mixed reality experience using an iPhone. Record in full HD and apply anti-aliasing to holograms and even shadows. It is a cost-effective and quick way to capture video of holograms. Live demos: Stream live mixed reality experiences to an Apple TV directly from your iPhone or iPad, lag-free! Share the experience with guests: Let non-HoloLens users experience holograms directly from their phones or tablets. Network auto-discovery for adding phones to the session. Automatic session handling, so users are added to the correct session. Spatial synchronization of Holograms, so everyone sees holograms in the exact same place. Recording of video + holograms + ambient sound + hologram sound. Share sheet so you can save video, email it, or share with other supporting apps. The Spectator View (Preview) code cannot be used with the Spectator View Pro version code. We recommend to implement it in new projects where video recording of holograms is required. Spectator View uses Unity Networking (UNET) for its network discovery and spatial syncing. This means all interactivity during the application needs to be synced between the devices. Prepare your scene, ensuring all visable gameobjects within your scene are contained under a world root gameobject. 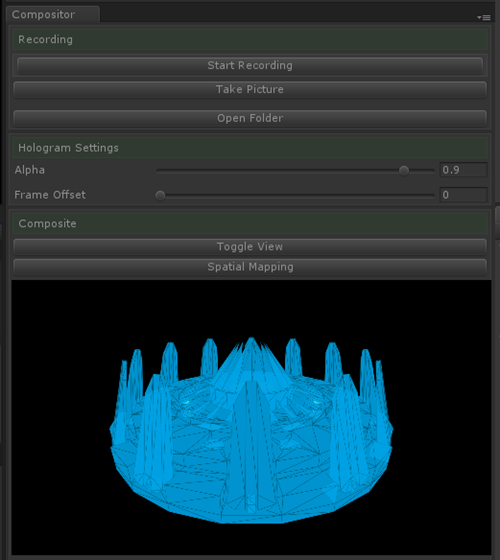 Add the SpectatorView prefab (Assets/HoloToolkit-Preview/SpectatorView/Prefabs/SpectatorView.prefab) into your scene. Add the SpectatorViewNetworking prefab (Assets/HoloToolkit-Preview/SpectatorView/Prefabs/SpectatorViewNetworking.prefab) into your scene. Select the SpectatorViewNetworking gameobject and on the SpectatorViewNetworkingManager component, there's a few things you can link up. If left untouched this component will search for necessary scripts at runtime. Spectator View uses UNET for its networking and manages all host-client connections for you. Any app specific data has to be synced and implemented by you, using e.g. SyncVars, NetworkTransform, NetworkBehavior. When building for iOS, ensure you remove the GLTF component of MRTK as this is not yet compatible with this platform. At the top level of the SpectatorView prefab there is a component called 'Platform Switcher'. Select the platform you want to build for. If selecting 'Hololens' you should see all gameobjects beneath the iPhone gameobject in the SpectatorView prefab become inactive and all the gameobjects under 'Hololens' become active. This can take a little while as depending on the platform you choose the HoloToolkit is being added or removed from the project. Ensure you build all versions of the application using the same Unity editor instance (do not close Unity between builds) due to an unresolved issue with Unity. Once you have built and deployed a version of you application on iPhone and on HoloLens, you should be able to connect them. Ensure that both devices are on the same Wi-Fi network. Start the application on the both devices, in no specific order. The process of starting the application on the iPhone should trigger the HoloLens camera to turn on and begin taking pictures. As soon as iPhone app starts, it will look for surfaces like floors or tables. When surfaces are found, you should see a marker similar to the one below. Show this marker to the HoloLens. Once the marker has been detected by the HoloLens it should disappear and both devices should be connected and spatially synced. To capture and save a video from the iPhone, tap and hold the screen for 1 second. This will open the recording menu. Tap the red record button, this will start a countdown before beginning to record the screen. To finish recording tap and hold the screen for another 1 second, then tap the stop button. Once the recorded video loads, a Preview button (blue button) will appear, tap to watch the recorded video. Open the Share sheet and select Save to camera roll. This could be the Windows Firewall. Go to Windows Firewall options. Allow an app or feature through Windows Firewall. For all instances of Unity Editor in the list tick, Domain, Private and Public. Then go back to Windows Firewall options. All instances of Unity Editor should have a green tick. In the action dialog select Allow the connection. 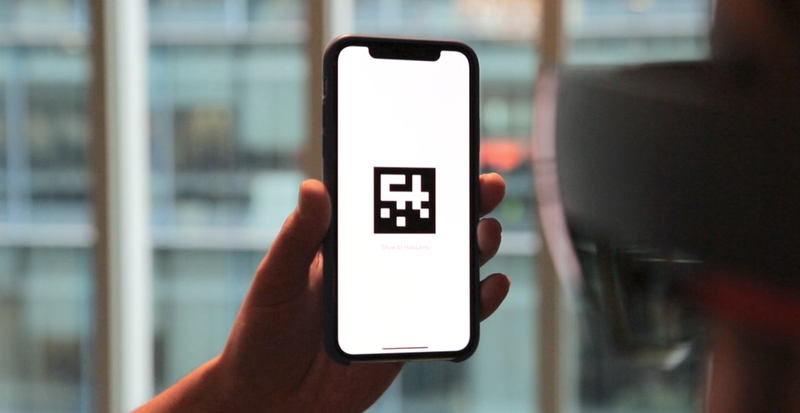 At runtime the iPhone screen says "Locating Floor..." but does not display an AR marker. The iPhone is looking for a horizontal surface so try pointing the iPhone camera towards the floor or a table. This will help ARKit find surfaces necessary to spatially sync with HoloLens. HoloLens camera does not turn on automatically when iPhone tries to join. Make sure both HoloLens and iPhone are running on the same Wi-Fi network. Goto the NewDeviceDiscovery component and change the both the Broadcast Key and Broadcast port to two unique values. Go to SpectatorViewDiscovery and change the Broadcast Key and Broadcast port to another set of unique numbers. The HoloLens won't connect with the mac Unity Editor. This is a known issue which could be linked to the Unity version. Building to the iPhone should still work and connect as normal. The HoloLens camera turns on but is not able to scan the marker. Ensure that you build all versions of the application using the same Unity Editor instance (do not close Unity between builds). This is due to an unknown issue with Unity. An app built specifically to enable spectator view, which is based on shared experiences in mixed reality. 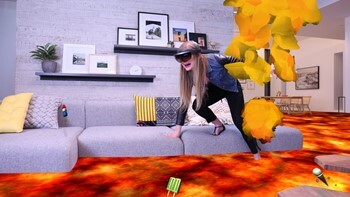 A user wearing HoloLens using the app. A spectator view camera rig providing a third-person perspective video. A desktop PC running the shared experience app and compositing the holograms into a spectator view video. Spectator view can be used for sharing your holographic creations, whether they're a still image, a video clip, or a live demonstration. Using this technology, you can capture high resolution images of your holograms. These images can be used to showcase content at marketing events, send to your potential clients, or even submit your application to the Windows Store. You get to decide which photo camera you would like to use to capture these images, as such you may prefer a quality DSLR camera. Photo capture example - making it appear the floor is made of lava. Videos are the best story telling mechanism for sharing a holographic app experience with many people. Spectator view lets you choose the camera, lens, and framing that best suits how you want to showcase your app. It puts you in control of the video quality based on the video hardware you have available. Video capture example - recording a mixed reality collaboration experience. Spectator view is a preferred approach for live demonstrations as the camera position remains steady or controlled. Because you can use a high-quality video camera, you can also produce high-quality images meant for a big screen. This is also appropriate for streaming live demos on a screen, possibly to eager participants waiting in line for their turn. 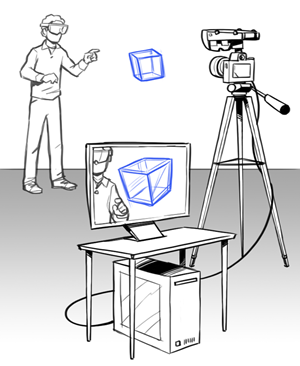 Mixed reality capture (MRC) provides a video composite of what the HoloLens user is seeing from a first person point-of-view. 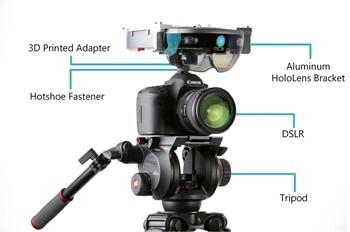 Spectator view produces a video from a third-person perspective, allowing the video observer to see the environment with holograms and the user wearing a HoloLens device. Because you have a choice of camera, spectator views can also produce higher resolution and better quality images than the built-in HoloLens camera used for MRC images. For this reason, spectator view is better suited for app images in the Windows Store, marketing videos, or for projecting a live view for an audience. 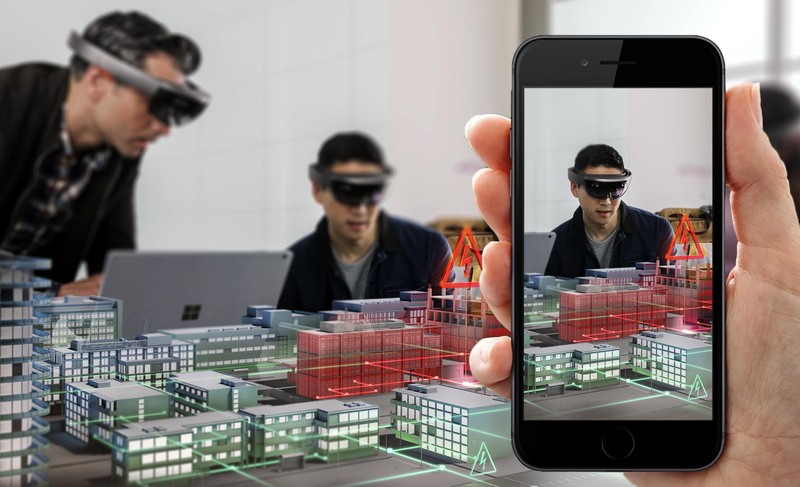 Spectator view has been an essential piece of how Microsoft HoloLens has presented experiences to audiences since the very beginning when the product was announced in January 2015. The professional setup used had high demands and an expensive price tag to go with it. For example, the camera uses a genlock signal to ensure precise timing that coordinates with the HoloLens tracking system. 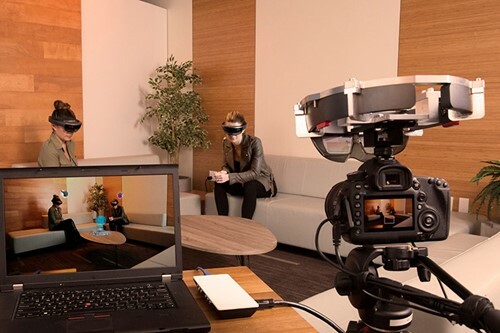 In this setup, moving the spectator view camera was possible while keeping holograms stable to match the experience of someone who is seeing the experience directly in HoloLens. 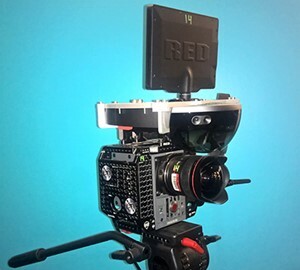 The open-source version of spectator view trades off the ability to move the camera rig in order to dramatically lower the cost of the overall setup. This project uses an external camera rigidly mounted to a HoloLens to take high-definition pictures and video of your holographic Unity project. During live demonstrations, the camera should remain in a fixed position. Movement of the camera can lead to hologram jitter or drift. This is because the timing of the video frame and the rendering of holograms on the PC may not be precisely synchronized. Therefore, keeping the camera steady or limiting movement will produce a result close to what the person wearing a HoloLens can see. To make your app ready for spectator view, you'll need to build a shared experience app and ensure the app can run on both HoloLens as well as desktop in the Unity editor. The desktop version of the app will have additional components built in that composite the video feed with the rendered holograms. Below is a recommended list of hardware, but you can experiment with other compatible units too. Camera with HDMI out or photo capture SDK For photo and video capture, we have tested the Canon EOS 5D Mark III camera. For live demonstrations, we have tested the Blackmagic Design Production Camera 4K. Note, any camera with HDMI out (e.g. GoPro) should work. Many of our videos use the Canon EF 14mm f/2.8L II USM Ultra-Wide Angle Fixed Lens, but you should choose a camera lens that meets your needs. Capture card for your PC to get color frames from your camera to calibrate your rig and preview your composite scene We have tested the Blackmagic Design Intensity Pro 4K capture card. Software downloaded from the GitHub project for spectator view. Search for Desktop Video Developer SDK in "Latest Downloads". Search for Desktop Video Software Update in "Latest Downloads". Ensure the version number matches the SDK version. OpenCV 3.1 For calibration or video capture without the Blackmagic capture card. If you are using a Canon camera and have access to the Canon SDK, you can tether your camera to your PC to take higher resolution images. Unity for your holographic app development. Supported version can be found in the OSS project. Visual Studio 2015 with latest updates. Use a T7 screwdriver to remove the headband from the HoloLens. Once the screws are loose, poke them out with a paperclip from the other side. Remove the screw cap on the inside front of the HoloLens visor with a small flat head screwdriver. Use a T15 screwdriver to remove the small torx bolts from the HoloLens bracket to remove the U and Hook-shaped attachments. Place the HoloLens on the bracket, lining up the exposed hole on the inside of the visor with the extrusion on the front of the bracket. The HoloLens' arms should be kept in place by the pins on the bottom of the bracket. Reattach the U and Hook-shaped attachments to secure the HoloLens to the bracket. Attach the hotshoe fastener to the hotshoe of your camera. Attach the mount adapter to the hotshoe fastener. Rotate the adapter so the narrow side is facing forward and parallel to the camera's lens. Secure the adapter in place with a 1/4" nut using the 7/16 nut driver. Position the bracket against the adapter so the front of the HoloLens' visor is as close as possible to the front of the camera's lens. Attach the bracket with 4 1/4" nuts and bolts using the 7/16 nut driver. Install the software from the software components section. Add the capture card to an open PCIe slot on your motherboard. Plug an HDMI cable from your camera to the outer HDMI slot (HDMI-In) on the capture card. Plug an HDMI cable from the center HDMI slot (HDMI-Out) on the capture card to an optional preview monitor. Change your camera to Video Mode so it outputs at the full 1920x1080 resolution rather than a cropped 3:4 photo resolution. Find your camera's HDMI settings and enable Mirroring or Dual Monitor. Set the output resolution to 1080P. Turn off Live View On Screen Display so any screen overlays do not appear in the composite feed. Turn on your camera's Live View. If using the Canon SDK and would like to use a flash unit, disable Silent LV Shoot. Plug an HDMI cable from the camera to the outer HDMI slot (HDMI-In) on the capture card. After setting up your spectator view rig, you must calibrate in order to get the position and rotation offset of your camera to your HoloLens. Open the Calibration Visual Studio solution under Calibration\Calibration.sln. In this solution, you will find the file dependencies.props which creates macros for the inc locations of the 3rd party sources. Print out the calibration pattern Calibration\CalibrationPatterns\2_66_grid_FULL.png on a flat, rigid surface. Plug your HoloLens into your PC over USB. Update the preprocessor definitions HOLOLENS_USER and HOLOLENS_PW in stdafx.h with your HoloLens' device portal credentials. Attach your camera to your capture card over HDMI and turn it on. A picture will automatically be taken when a checkerboard is in view. Look for the white light on the HoloLens' visor before advancing to the next pose. When finished, press Enter with the Calibration app in focus to create a CalibrationData.txt file. DSLR RMS should be close to 0. HoloLens RMS should be close to 0. Stereo RMS may be 20-50, this is acceptable since the field of view between the two cameras may be different. Translation is the distance from the HoloLens' camera to the attached camera's lens. This is in meters. Rotation should be close to identity. DSLR_fov y value should be close to the vertical field of view expected from your lens' focal length and any camera body crop factor. If any of the above values do not appear to make sense, recalibrate. Copy this file to the Assets directory in your Unity project. The compositor is a Unity extension that runs as a window in the Unity editor. To enable this, the Compositor Visual Studio solution first needs to be built. Update dependencies.props with the same criteria from the Calibration solution above. If you followed the calibration steps, this file will already have been updated. Build the entire solution as Release and the architecture that matches your Unity version's architecture. If in doubt, build both x86 and x64. If you built the solution for x64, also build the SpatialPerceptionHelper project as x86 since it will run on the HoloLens. Close Unity if it is running your application. Unity needs to be relaunched if DLLs are changed at runtime. Run Compositor\CopyDLL.cmd to copy the DLLs built from this solution to your Unity project. This script will copy the DLLs to the included sample project. Once you have your own project set up, you can run CopyDLL with a command line argument pointing to your project's Assets directory to copy there as well. Launch the sample Unity app. The compositor runs as a window in the Unity Editor. The included sample project has everything set up to work with spectator view once the compositor DLLs are copied. Spectator view requires the application to be run as a shared experience. This means that any application state changes that happen on the HoloLens need to be networked to update the app running in Unity too. Copy Assets/Addons/HolographicCameraRig from the sample project to your project. Add the latest MixedRealityToolkit to your project, including Sharing, csc.rsp, gmcs.rsp, and smcs.rsp. 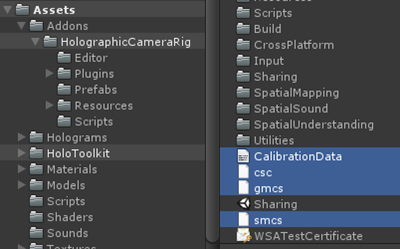 Add your CalibrationData.txt file to your Assets directory. HolographicCameraManager should be populated with the HolographicCameraManager prefab from the HolographicCameraRig prefab directory. Anchor should be populated with the Anchor prefab from the HolographicCameraRig prefab directory. Sharing should be populated with the Sharing prefab from the MixedRealityToolkit. Note: If any of these prefabs already exist in your project hierarchy, the existing prefabs will be used instead of these ones. Spectator View IP should be the IP of your HoloLens attached to your spectator view rig. Sharing Service IP should be the IP of the PC running the MixedRealityToolkit SharingService. Optional: If you have multiple spectator view rigs attached to multiple PC's, Local Computer IP should be set with the PC the spectator view rig will communicate with. Build and deploy the app as a D3D UWP to the HoloLens attached to the spectator view rig. Deploy the app to any other HoloLens devices in the experience. Check the Run In Background checkbox under edit/project settings/player. Visualize the scene's composite view as well as color, holograms, and alpha channel individually. When the camera is moved, holograms in Unity should be where they are in the real world relative to your camera color feed.